This morning’s Berkshire Eagle headline reminded me that it’s time to take down the bird feeder. I haven’t yet encountered a black bear in the Berkshires, but last year neighbors on either side of our house saw one, so it must have crossed our yard. Last year there was also a moose sighting in the neighborhood. Don’t run. Running will make the bear think you are prey, and that could cause the animal to chase you. Despite their lumbering appearance, black bears can run fast — far faster than humans — so don’t try to outrun one. Make noise. 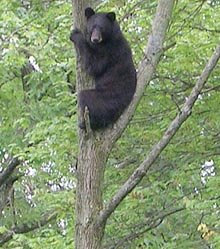 Most black bears will retreat if you make noise or throw an object in their direction. If you find yourself face to face with a bear, have someone farther away create loud noises as a distraction, then back away from the bear slowly.